Hey, hey! I made us some cinnamon pumpkin goodness! Just kidding, but today marks the first day of fall, so these are finally acceptable. 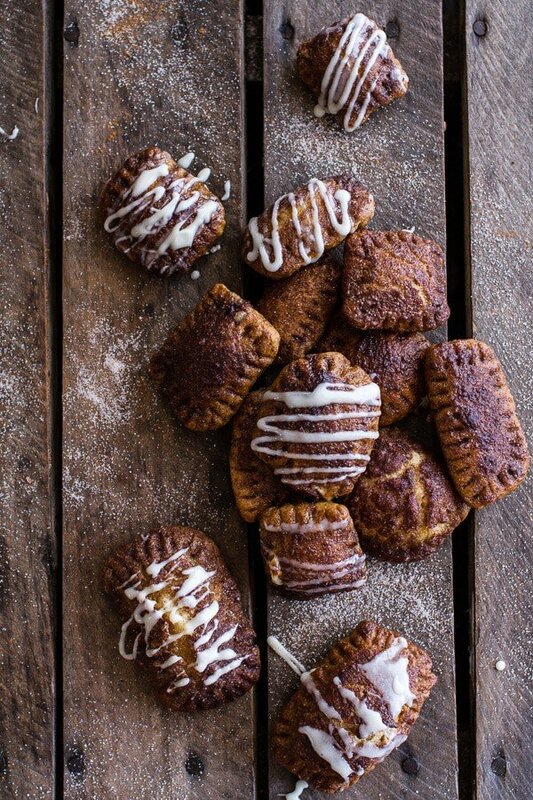 As of the last couple days I have made us a lot of cinnamon goodness because I honestly cannot get enough cinnamon in my life right now – talking sweet and savory people. Asher and I are calling ourselves cinnamon freaks because cinnamon has been the main ingredient in practically all of our meals lately. I am on a huge kick and everything needs to involve either cinnamon, pumpkin, apples, or butternut squash (acorn and spaghetti too). I am also in love with figs at the moment as well. Oh, and cheese and stews + soups, cookies, pies and all of the cozy foods. Basically, I am obsessed with all things fall like. I think it’s because we are immersed in fall up here in the mountains. You see, our trees are the most gorgeous shades of yellow and orange right now, and my little mini pumpkin collection in my office (because there is no room anywhere else) is just so cute, and the weather was so incredible last weekend. It was a perfect fall Saturday that ended with a cozy storm late Sunday afternoon. It was one of those fall days that makes you just want to snuggle up by the fire with a good magazine. I didn’t do that because I had a chicken to roast and a bunch of boring emails to respond to, but I was wishing that’s what I was doing. Fall is awesome up here, but it doesn’t last long. Soon the white stuff will be falling and mixing itself in like in this picture of a nearby trail in Dillon. 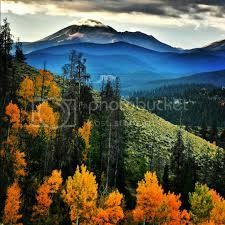 Can I also just say that if you have never been to Colorado in the fall than you should probably schedule a trip. But come in late September or early October. By late October we are pretty much into winter up here in the mountains. Halloween equals a very, very cold night with snow showers and freezing temps totally possible. So now that it is officially fall, I figured it was time for a real pumpkin recipe. I have so many that I want to share this year, but I promise I will try not to overload you guys with “fall” recipes and pumpkin this, pumpkin that. It’ll be a good balance of everything… I hope. I think you can tell, I am pretty excited about this fall season. It holds so many exciting things for me and I am not just talking about the food, although that’s where it all starts. Even still, I promise not to go overboard, Or I will try not to go overboard. I mean, fall has so many other great things to offer. Now about these cute little bagel poptart things I made here. My family is a tad addicted to them. Can you blame us though? See, these are kind of like a bagel cinnamon roll. 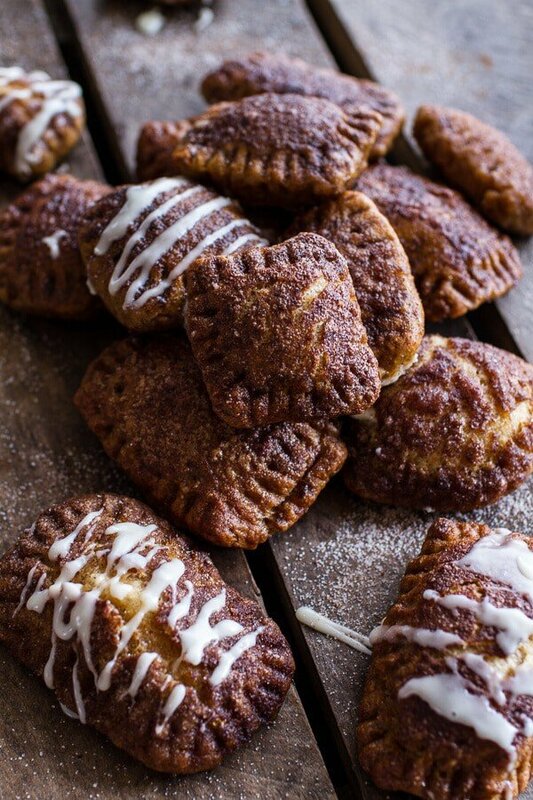 They may even be better than a cinnamon roll though because, do you see all the cinnamon sugar on these things?? 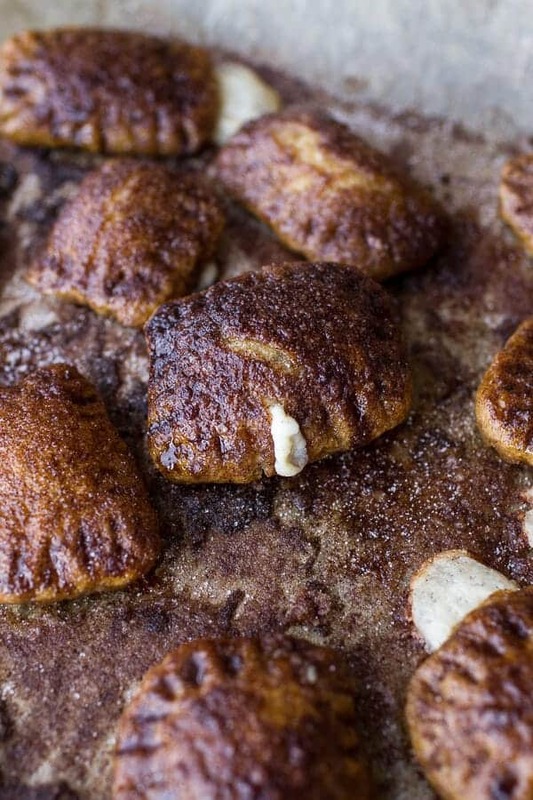 Not to mention that they are stuffed with sweetened whipped cream cheese? 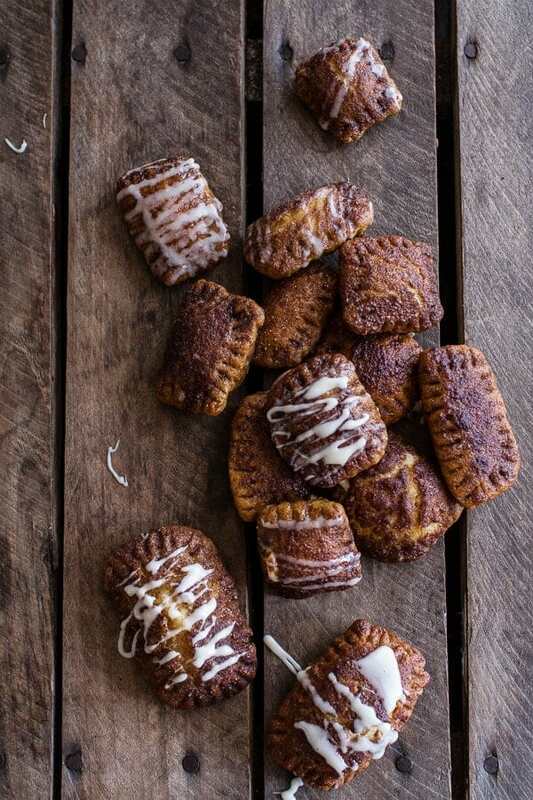 Don’t worry though, I made them with pumpkin and whole wheat flour, so that equals a balanced breakfast or afternoon snack, right? Yup, let’s just at least tell ourselves that. These are actually pretty basic, so don’t be intimidated. The bagel dough is adapted from my go to bagel recipe (it’s easy!). I literally just added some pumpkin and cinnamon. 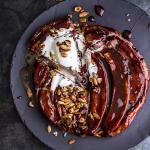 The filling is a whipped cream cheese and the toppings are as simple as cinnamon, sugar and a drizzle of white chocolate glaze. The hardest part is rolling and filling the bagels, and it’s not really that it’s that hard, it’s just a little tedious. I found that I liked smaller sized bagel poptarts vs larger ones. 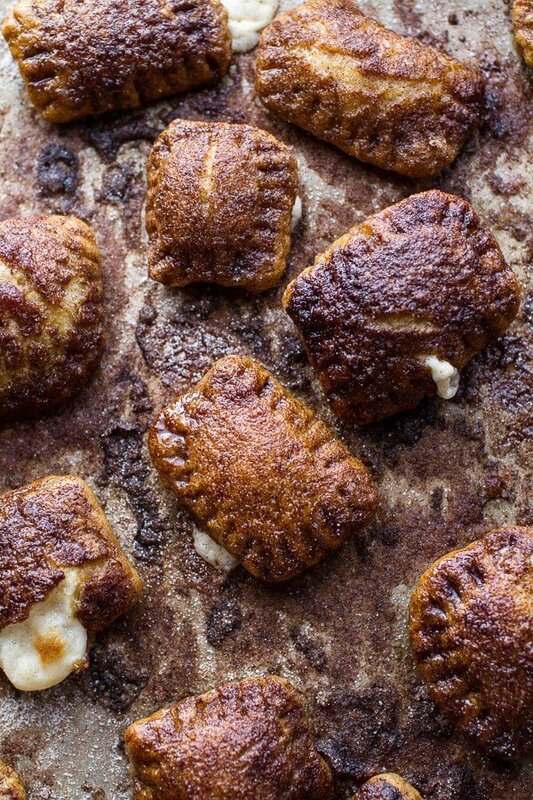 With a smaller size you get a better ratio of bagel, filling and cinnamon sugar. Plus, everything mini is always better… or at least cuter. Once you have boiled the bagels, you dip them into browned butter (ah huh) and a good, heavy dusting of cinnamon sugar. Perfection. Well, almost. You really need the sweet white chocolate drizzle. You do, you do. Just ask Asher, I ran out and she almost cried. We obviously made more. In the bowl of a stand mixer fitted with a dough hook, combine water, yeast and honey, stir to combine, then let sit until foamy, about 5-10 minutes. Once foamy, gradually mix in the salt, cinnamon, bread flour, 2 cups of white whole wheat flour and the pumpkin with the mixer on low speed. After 5 minutes or so, if the dough is still sticky, add the remaining white whole wheat flour a 1/4 cup at a time until the dough pulls away from the sides of the bowl. Knead for 3-5 minutes longer. Remove the dough from the bowl (it should be thick and stiffer than most yeast breads) and knead a few times with your hands on a floured surface, forming it into a ball. Brush a large bowl with oil. Place the dough inside, turning to coat. Cover the bowl with a wet towel or plastic wrap. Allow the dough to rise in a warm place until doubled in size – about 1 to 1 1/2 hours. While the dough is rising, whip together the cream cheese and brown sugar using a hand held or stand mixer until smooth and creamy. Once the dough is doubled, punch down the dough and place on a clean, floured counter. Divide the dough into fourths. Working with one section of dough at a time (make sure the other dough is covered while you work), roll the dough out onto a lightly floured surface to a 1/4 inch thickness. 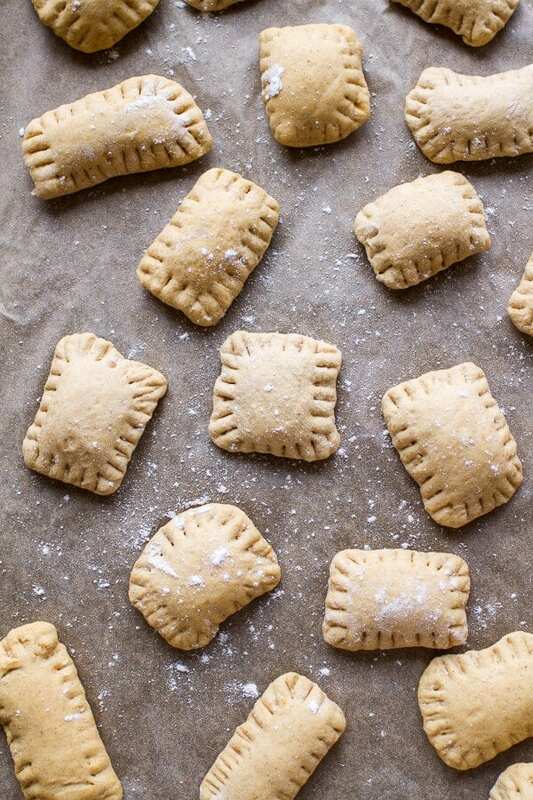 Using a pizza cutter or sharp knife, cut the dough into rectangles (about 1 1/2 x 3 inches). 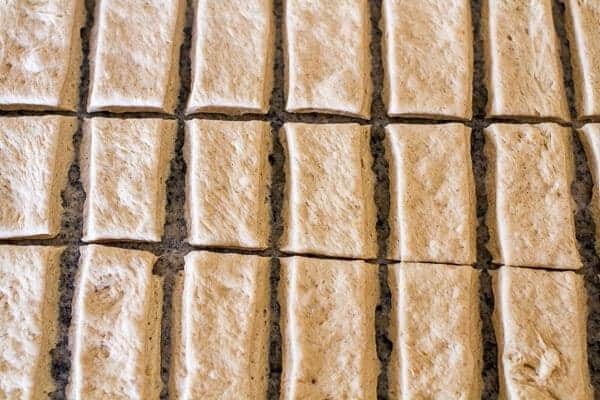 Now take one of the rectangle and using a rolling pin, roll it to about double its original size. Place a teaspoon size dollop of cream cheese on one end of the dough. Fold the other end of the dough over the cream cheese. Crimp the edges together using the ends of a fork. Place on a parchment lined baking sheet and cover with a wet towel. Repeat with the remaining dough until all the dough has been used. Make sure all the stuffed bagels are covered with a damp towel and allow them to rise about 10 minutes. Meanwhile, add the butter to a heavy-bottomed sauce pan. Melt over medium heat until just browned, whisking every 30 seconds. Remove from the heat. In a bowl mix together the sugar and 4 teaspoons cinnamon. Bring a large pot of water to a boil and add the brown sugar. Preheat the oven to 425 degreesWhen the bagels are ready, lower a few at a time into the water. Boil for 1-2 minutes then flip to the other side and boil for 1 additional minute. Using a slotted spoon or spider strainer, remove the bagels from the pot, letting the water drain, and then transfer to the prepared baking sheet. Continue until you've boiled all of the bagels. Now dip each bagel through the browned butter and then either toss through the cinnamon sugar or sprinkle the cinnamon sugar all over the bagel. Place back on the baking sheet. Bake for 10-15 minutes (maybe 20 minutes if yours are larger) or until the bagels are browned. Some of the cream cheese may ooozz out, don't worry, it happens. To make the white chocolate drizzle, mix together the melted white chocolate, heavy cream (or milk) and vanilla. Whisk in the powdered sugar. If needed thin with cream. Drizzle the frosting over the bagels. 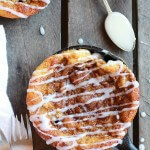 Enjoy warm...with more cinnamon sugar if needed!! Come on, doesn’t that look so delicious??. These cute little bagels will put smiles on everyone’s faces! I’m all over anything cinnamony + sugary + pumpkiny!! These are gorgeous! Oh my yum. No stoppit now. 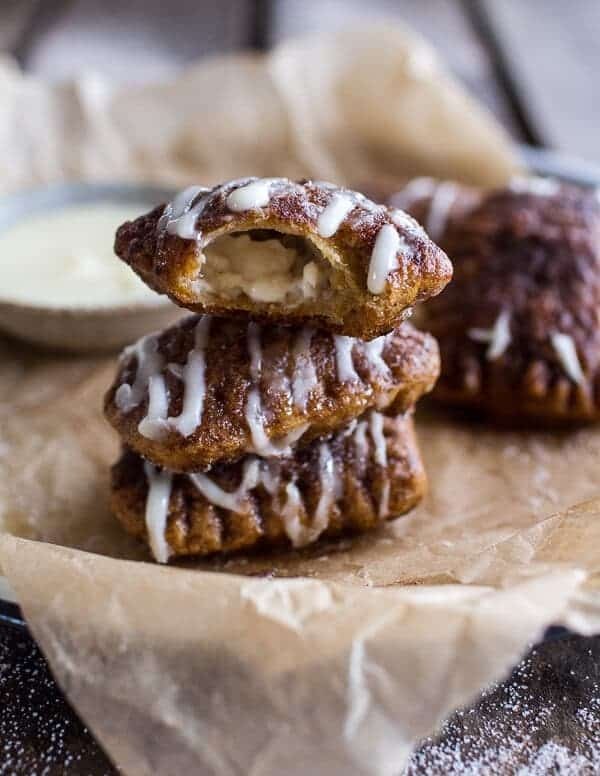 These look insanely delicious…cinnamon raisin bagels are my favorite and these stuffed and sprinkled with all that cinnamon and sugar look so yummy…I agree mini food is better. 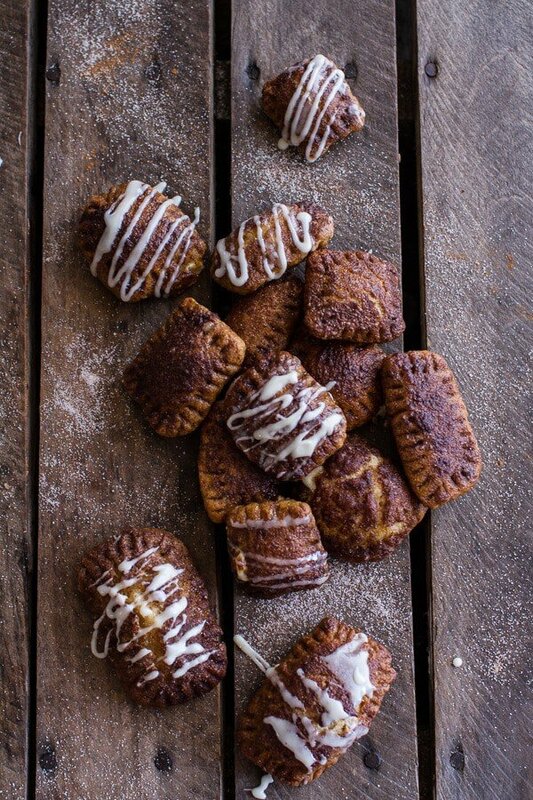 Just dreaming about being your official taste tester……….. Those would taste very good with my cup of coffee. Haha! Thanks so much, Brenda! Haha! not sure about that, but thank you! I am almost 4000′ , any suggestions for adjustments? I am sorry, I do not understand? I live at almost 4000′ We have to make ingredient adjustments because of this, for baking items to turn out. Usually more flour. more liquid, less yeast/baking powder..Temp and time change too. My cooking ‘bible reference is U of CO. Just a reminder not everyone lives at sea level. I will try , then to find a very similar recipe and try to convert it to this one. as far as spices, etc. thanks for the recipe I’ll let you know what i figure out. If you notice on a prepackaged dessert products, for example.. there are usually High Altitude adjustments listed. When ‘we ‘can’ water bath & pressure processing have mandatory changes. Again..this sounds yummy..and will try it soon. Hey Leslie, I actually live in the mountains of CO at 9,000 feet. I am well aware of altitude and baking. For this recipe I did not make any adjustments (to be honest, i normally do not make adjustments for elevation as I find it never works out) and do not think you need to either. Please let me know if you have any more questions. Hope you love these! Interesting. You NEVER ever make any adjustments or just to this recipe? i do in many baked items, always. My recipes for baked that i made at the coast..needed some help over here. And of course canning!! Boiling eggs, always takes 20 minutes…NOT the 10 at sea level. Can not bake a cake in 8″ pans have to use 9″ always now. I will try the ‘pop tarts’ soon. Not a fan of pumpkin pie, but do like pumpkin , so this looks good. Okay. This is too much deliciousness. They’re like perfect little pillows of fall. I need this in my life! This is the most creative pumpkin recipe I’ve seen this year. SO YUM! OMG these sound sooo sooooo super amazing! WANT!!! these are adorbs! i am currently in the midst of making some pumpkin cakes with cream cheese frosting, and pumpkin + cream cheese = WIN. but pumpkin + cream cheese + BAGELS??! amazing. Yeah for F-A-L-L! I’m so excited too! My favorite time of year. I grew up in New England, so fall is just a thing that people there really treasure. And it’s so wonderful! Loving these treats. Wish I had one right now with my morning coffee! Fall in New England sounds incredible! Happy first day of fall , what a lovely way to welcome in the season!! I need to make these, they seriously look incredibly delicious!! Happy first day fall!! Thanks Sharana! I can’t stand how awesome this is! It makes my regular pumpkin bagels seem downright boring. Pinned! You have to make it out here in the fall, so pretty! these look phenomenal. I love! The title just kept getting better with every word! That bottom shot with the bite is ridiculous. YUM. I agree with Angela–first finish the barn, take time to enjoy the barn, and then make a cookbook–LOL. I can’t wait for the maple trees here to change. Tieghan these look so yummy!! 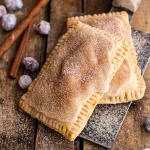 Cinnamony pop tarts stuffed with cream cheese – Girl fall can’t get better!! These look incredible Tieghan! I can’t wait to make them! Thank you, Kathy! Hope you are having good week! I want to cozy up with a bowl full of these beauties. Nom! 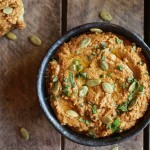 Yay for pumpkin goodness, these look incredible!! 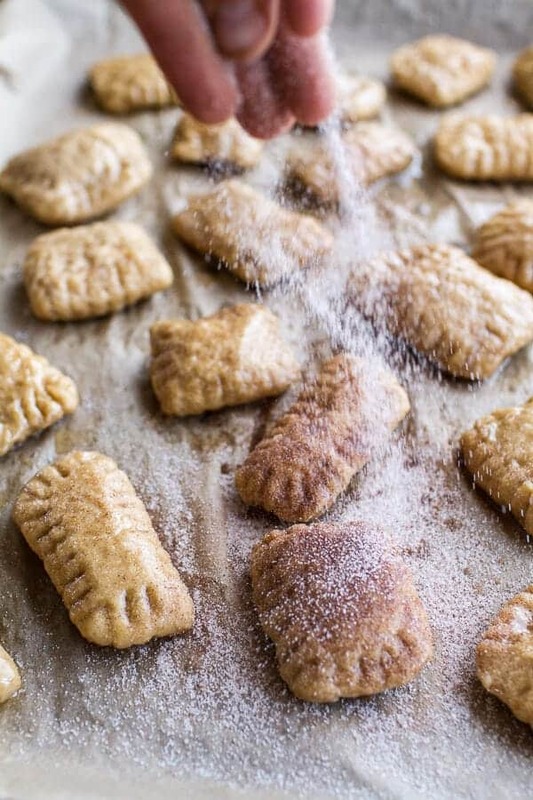 Love that cinnamon sugar coating! Thank you, Laura! 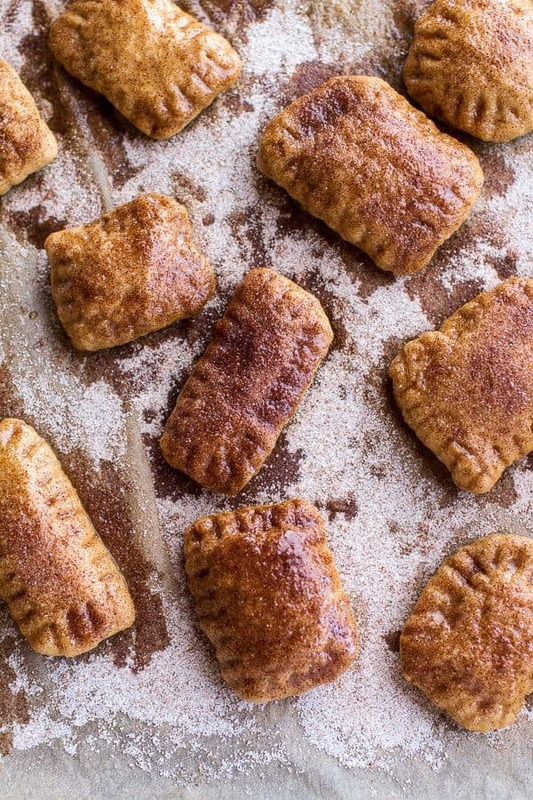 Cinnamon sugar is the best, right?! I am totally on a cinnamon kick right now, too! Which is why I need like a bajillion of these pop tarts in my belly ASAP. 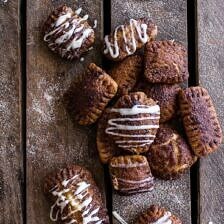 These look amazing and I’m making them asap! What temperature should I set the oven to? Thanks Jenny! The oven temp should be 425 degrees F. Hope you love them! I cannot wait to try these! 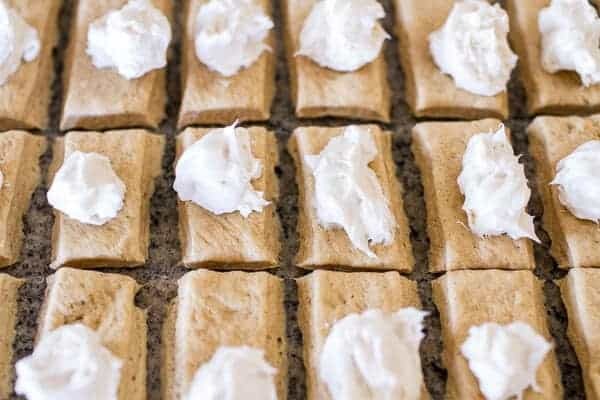 I’ve always wanted to try making poptarts from scratch, but these look crazy good! Thanks a bunch for sharing such a cool recipe!